He’d been traveling for weeks, following the river westward. A great aerial beast with a broken wing trying to follow the curving lines of a bigger, blacker beast on terra firma. Beneath him, the Lethe River twisted and writhed. Every left turn was agonizing. The wing, bent at an unnatural angle, caught wind where it shouldn’t. The drag was enormous. He often felt as if he were drowning, his wings clasping at the edges of a whirlpool whose edges grew taller and steeper as it closed in on him. And then he’d have to push, soaring up into the air again with labored breathing that sounded louder than a blue whale’s blowhole. As he neared New Babylon he kept a keen eye on the water, searching for boats and sails and men. Men who may not have seen a drakon in decades, perhaps longer. Men who would sound an alarm and alert others to his presence. It was the type of homecoming he wished to avoid. So he’d flown at night and timed his arrival with the new moon. All below was black and gray. Far off there were tall ships lit by lanterns, but closer (thank Luck closer) was his goal – Bradbury’s docks. A man without fire or an electric torch would have been blind. But to a drakon, the world seemed drawn with charcoal and smudged with starlight. Another night, with a different wing and the company he sought, he might have thought it beautiful. He smelled the river and the city, the scents of men and the rich food they liked to eat. Loud, boisterous voices rose from the waterside inns, saloons, and taverns. He clenched his jaw and banked left across the water toward Etincelle, straightening again – or at least trying to – before he got too close. With a last, desperate push up he rose above the Lethe, beating his inefficient wings against the midnight sky, until he found warm air to ride down, circling… waiting… watching for anyone who might still be at the docks. He did not want to be seen in drakon form. He landed less gracefully than he would have liked, skidding to a halt just before hitting a crate that would have tumbled into the Lethe had he not finally found purchase on the dock with his claws. With a last glance around, he shifted. Wings collapsed. Snout, jaws, and teeth were reabsorbed. Claws disintegrated, turning to dust. Tail wriggled and twisted, curling inward, like a snake eating itself. Lungs and heart halved. And then halved again. Head pounding, body shaking, Ari fell to his knees, his right palm pressed against the dock, his left arm cradled uselessly against his side. Jill Archer is the author of the Noon Onyx series, genre-bending fantasy novels about a postgrad magic user and her off-campus adventures. 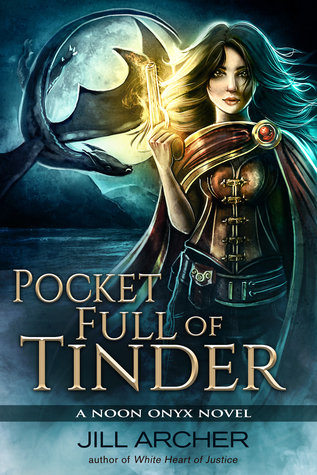 The series includes DARK LIGHT OF DAY, FIERY EDGE OF STEEL, WHITE HEART OF JUSTICE, and the upcoming POCKET FULL OF TINDER. Looks like an intriguing book! I can't wait to learn about Drakons. Sounds great!